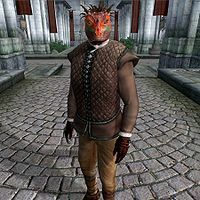 Gin-Wulm is an Argonian smith working at The Best Defense in the Imperial City’s Market District. He is also the master trainer in Armorer. Because of the never-ending arguments between the two vendors of The Best Defense, Varnado and Maro Rufus, Gin-Wulm spends as little time in the shop as he possibly can and only enters when the other two are either asleep or gone. His room is located in the basement and he sleeps down there every night between midnight and 8am. When he wakes up, he immediately exits the shop and heads for the Elven Gardens District. Once there, he will wander around until midday, when he returns to the Market District. Still avoiding the shop, he will spend the next eight hours strolling around, while occasionally talking to the other merchants. At 8pm, he enters The Feed Bag and enjoys his dinner until his bedtime at midnight. On Loredas and Sundas, he skips dinner and enters The Best Defense while it’s empty, just to get some work done before bedtime. He will offer training at all times except when eating at The Feed Bag. He wears a pair of doeskin shoes, a quilted doublet and tan linens, all popular clothing for middle-class citizens. He carries the shop key and a leveled amount of gold. According to Gin-Wulm, working alongside two armor enthusiasts with different opinions can be quite a challenge: "Varnado and Maro Rufus? They don't get along. I don't understand it. I just make the armor, and keep it in good shape." Gin-Wulm is recognized as an expert by other armor specialists, albeit reluctantly. Rohssan will tell you that "Much as I hate to admit it, Gin-Wulm knows more about smithing than I do. Says it's in his blood." Rasheda suggests an alternative to talking to him: "The only way you're going to learn anything new now is by doing it yourself, or talking to Gin-Wulm. I'd suggest doing it by yourself. But if you're dead set on it, head to The Best Defense in the Imperial City. He's a smith there, and might be persuaded to train you." Once you have gained the necessary references from the advanced trainers in Armorer, speak to Gin-Wulm and he will give you the following task: "Mighty bold of you, asking for training. What makes you think you're worth my time? I bet you don't know the first thing about smithing. Have you read up on the history of the craft? I doubt it. You answer a simple question, and I'll think about training you. So here it is: What does the name Hazadir mean to you?" If you don’t know the answer, he’ll give you a hint: "Can't say I'm surprised. Few recognize the name anymore, even though he was famous. Had a book written about him, in fact! I don't have a copy myself, but there was one in First Edition last time I was browsing there. At least some people take an interest in history." Once you own or have read the book, the correct answer will pop up in his dialogue options and he will be more than happy: "Well, well! So you do know a thing or two... Hazadir was my great-great grandsire's sister's-son. Bet you didn't know that! All right. You're not hopeless. You want training, I'll train you." Esta página foi modificada pela última vez à(s) 01h53min de 23 de abril de 2013.